Are you using a Debian-based system? Great! I am here today with a good news for you. Say hello to “Debian-goodies”, a collection of useful utilities for Debian-based systems, like Ubuntu, Linux Mint. These set of utilities provides some additional useful commands which are not available by default in the Debian-based systems. Using these tools, the users can find which programs are consuming more disk space, which services need to be restarted after updating the system, search for a file matching a pattern in a package, list the installed packages based on the search string and a lot more. In this brief guide, we will be discussing some useful Debian goodies. Debian-goodies has just been installed. Let us go ahead and see some useful utilities. Let me start from one of my favorite, the “checkrestart” utility. When installing security updates, some running applications might still use the old libraries. In order to apply the security updates completely, you need to find and restart all of them. This is where Checkrestart comes in handy. This utility will find which processes are still using the old versions of libs. You can then restart the services. Since I didn’t perform any security updates lately, it shows nothing. Please note that Checkrestart utility does work well. However, there is a new similar tool named “needrestart” available latest Debian systems. The needrestart is inspired by the checkrestart utility and it does exactly the same job. Needrestart is actively maintained and supports newer technologies such as containers (LXC, Docker). The good thing is Needrestart works on other Linux distributions too. For example, you can install on Arch Linux and its variants from AUR using any AUR helper programs like below. The check-enhancements utility is used to find packages which enhance the installed packages. This utility will list all packages that enhances other packages but are not strictly necessary to run it. You can find enhancements for a single package or all installed installed packages using “-ip” or “–installed-packages” flag. For example, I am going to list the enhancements for gimp package. As the name implies, dgrep is used to search all files in specified packages based on the given regex. For instance, I am going to search for files that contains the regex “text” in Vim package. /usr/share/doc/vim-tiny/copyright: 1) This license text must be included unmodified. The dgrep supports most of grep’s options. Refer the following guide to learn grep commands. The dglob utility generates a list of package names which match a pattern. For example, find the list of packages that matches the string “vim”. By default, dglob will display only the installed packages. If you want to list all packages (installed and not installed), use -a flag. The debget utility will download a .deb for a package in APT’s database. Please note that it will only download the given package, not the dependencies. This is another useful utility in this collection. The dpigs utility will find and show you which installed packages occupy the most disk space. The debman utility allows you to easily view man pages from a binary .deb without extracting it. You don’t even need to install the .deb package. The following command displays the man page of nano package. If you don’t have a local copy of the .deb package, use -p flag to download and view package’s man page. An installed Debian package has not only a man page, but also includes other files such as acknowledgement, copy right, and read me etc. The debmany utility allows you to view and read those files. Choose the file you want to view using arrow keys and hit ENTER to view the selected file. Press q to go back to the main menu. If the specified package is not installed, debmany will download it from the APT database and display the man pages. The dialog package should be installed to read the man pages. If you’re a developer, the popbugs utility will be quite useful. It will display a customized release-critical bug list based on packages you use (using popularity-contest data). For those who don’t know, the popularity-contest package sets up a cron job that will periodically anonymously submit to the Debian developers statistics about the most used Debian packages on this system. This information helps Debian make decisions such as which packages should go on the first CD. 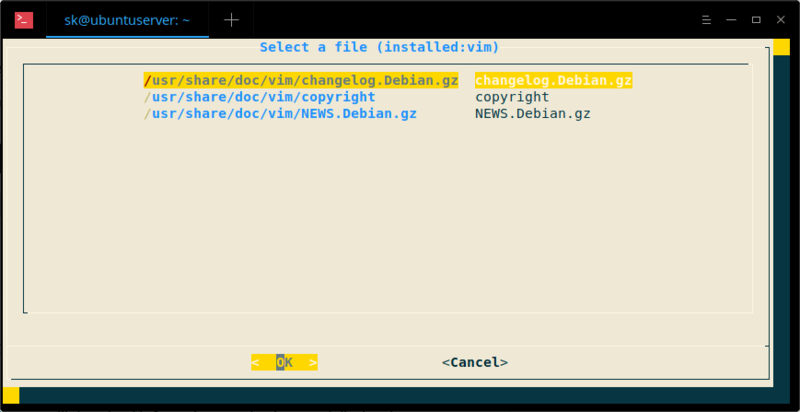 It also lets Debian improve future versions of the distribution so that the most popular packages are the ones which are installed automatically for new users. Also, you can save the result in a file as shown below. This command will display all the dependencies of the given package and when each dependency was installed. By using this information, you can easily find which package might have broken another at what time after upgrading the system or a package. The dhomepage utility will display the official website of the given package in your default web browser. For example, the following command will open Vim editor’s home page. And, that’s all for now. Debian-goodies is a must-have tool in your arsenal. Even though, we don’t use all those utilities often, they are worth to learn and I am sure they will be really helpful at times. I hope this was useful. More good stuffs to come. Stay tuned!